So after Rogers loss to Tsonga in Montreal the next bit of tennis us Fed fans have to look forward to is the Cincinnati Masters which starts on Monday. Where Federer will be the double defending champion. 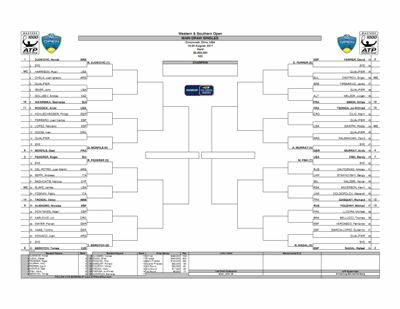 The draw has been released, with the likely second round opponent for Roger being none other than his 2009 US Open Conqueror, Juan Martin Del Potro. Arguably the worst match possible considering Fed keeps getting beaten by power hitters like Tsonga. I'm not sure the kind of form Del Boy is in, he just lost to Cillic in the Rogers Cup. So he's not exactly on US Open 09 form, but he maybe quickly improving, which is a worry. Federer is again in Djokovics half of the draw – should he play (I heard a rumour he way withdraw). It's looking likely he'll capture the title in Montreal should he beat Tsonga today, as his final opponents are either Janko Tipsarevic or my tip in my hard court season preview – Mardy Fish. He should beat either of those comfortably. 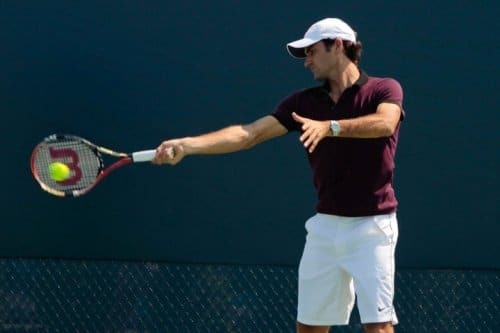 Should Federer get past Del Potro – he will probably face Marcos Bagdhatis or Victor Troiki, those should be easy wins, and it could be Berdych in the Quarters, but I'm not getting ahead of myself. What can we expect from Federer here? Making predictions around Rogers matches is becoming increasingly difficult – I predicted he would destroy Tsonga earlier in the week, which turned out to be totally wrong. Del Potro could be a difficult task – we saw Roger destroy him in the 2009 Australian Open – then lose in 5 in the US Open final after pressing the self destruct button – see video below (terrible umpiring by the way) so it's difficult to call. If we say Del Potro has a similar game to Tsonga (which he does in some respects – big big forehands) then it could be a really tough match and definitely not the sort you want in the second round of any tournament. But it's not a matchup yet – Del Potro has to get past Seppi in the first round so we will just have to wait and see. I played two matches, I feel good physically. New York is in one month (from August 29) – it's far away. For the time being, the focus is here, not elsewhere. But if you want to talk about the US Open, I can tell you I feel good mentally and I'm playing well. Thanks, I know but gotta stay positive, his game surely can’t disappear overnight. He was beating Novak on clay of all surfaces 3 months ago so all is not lost! I rather think Blake might be the R16 opponent : he’s played well so far in the US Open season but has had awful draws like Roger. Baghdatis is in terrible form and his game suits Blake, I think, Baghdatis prefers players who are quite passive. With Troicki it would be more leveled but I think Blake, who couldn’t play Montreal, will be very motivated at home and fitter than Troicki who has playerd a lot since Washington. Of course it’s hard to look after Del Potro, who can get back to form at any moment and will also be VERY motivated to defeat Roger. Del Po Blake Berdych in a row, would be very dangerous because very motivated and at least Del Po and Berdych have the game to beat Roger. 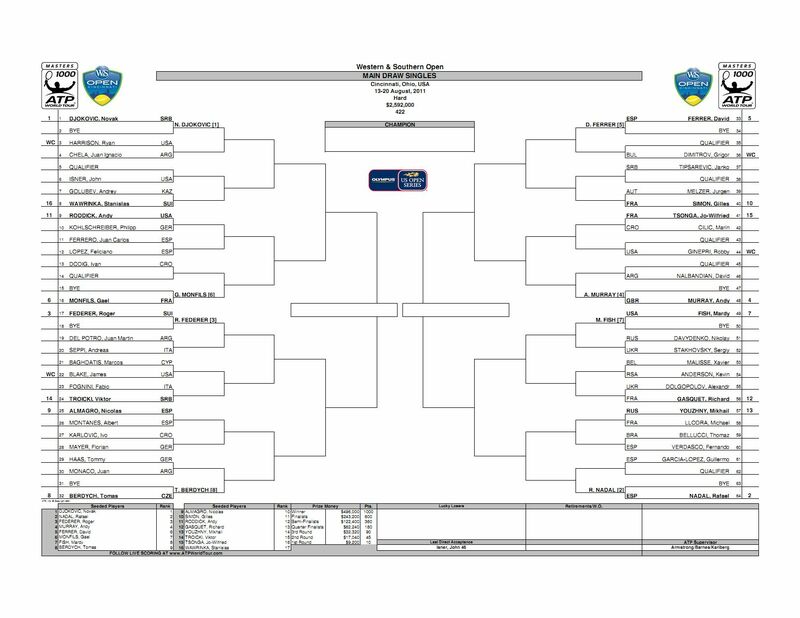 The most awful draw possible : when I saw that I thought “let’s think of the US Open”, this would need 2006 Federer. I agree Blake is on a little run – Gulbis win, and the match against Isner were good matches for him. Not sure I see him making a run in Cincy though – Bagdhatis might not be playing well, but Blake isn’t really capable of hurting him I don’t think, he’ll have to go for too many shots and his error count will be through the roof. He has never been able to consistently make shots. It is tough to predict the Del Po match – if they both bring their A game, it’s sure to be a great match, and if Fed brings his, and Del Po doesn’t then Fed wins. And vice versa.